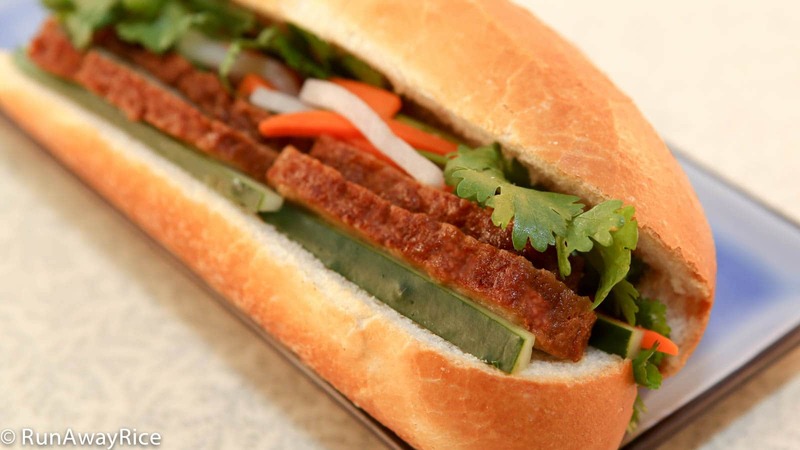 I love seitan and have touted its versatility as a tasty meat substitute in earlier posts. 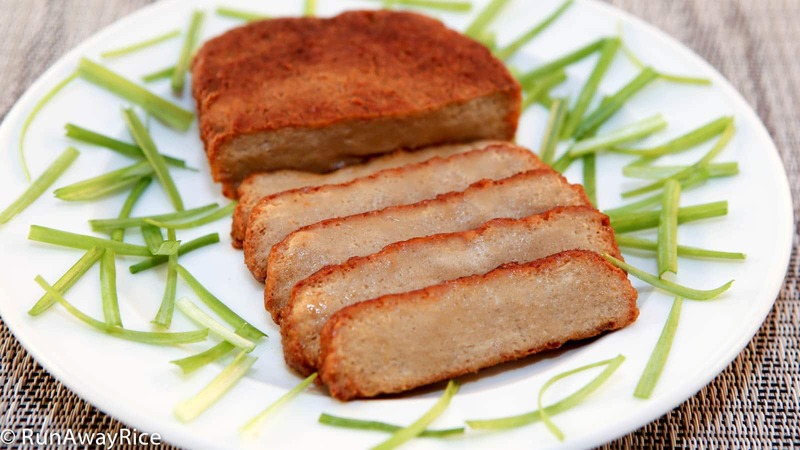 I’ve shared the basic seitan recipe and the one below is essentially the same except for two things: 1) we add soy sauce to the water to give it color and saltiness 2) we use a bit more baking powder to give it a more meat-like texture. 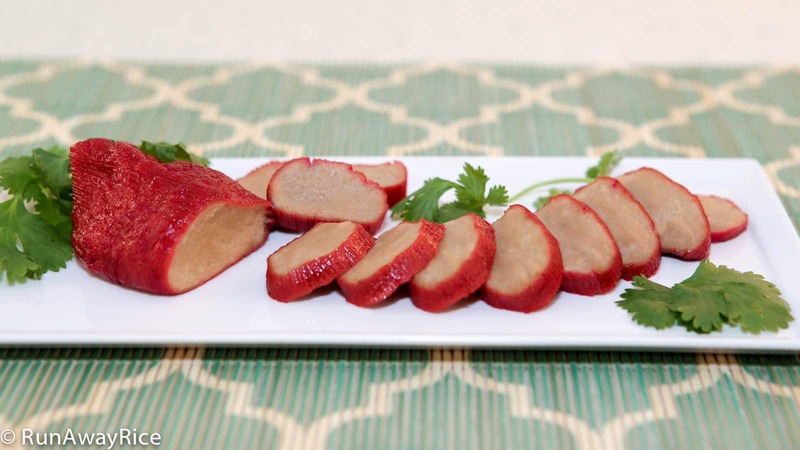 The fun part of this recipe is that we don’t just make a shapeless blob of seitan roast pork. Instead we use corn husks to wrap the seitan to give it texture similar to the grain in meat. The trick is not to wrap the bundle too tightly as seitan expands quite a bit when boiled. Also, we don’t need to be precise with the wrapping. The varying shapes make it more natural and meat-like. I hope you’ll give the recipe a try and let me know what you think! Not a fan of the packaged seasoning for roast pork? Don’t like all the food coloring and sugar? Below is my recipe for a homemade marinade. If using this version, omit the store-bought roast pork seasoning + soy sauce and use this to marinate the cooked seitan instead. If you enjoyed this recipe, you may also like: Curry Lemongrass Seitan Stir-Fry (Mi Can Xao Xa Ot) and Braised Seitan and Vegetables (Mi Can Kho Chay). In a large bowl combine water, soy sauce, salt and baking powder. Sift in the vital wheat gluten and mix well. Work the dough in your hands making sure all dry vital wheat gluten is completely incorporated. Shape and squeeze the dough into a large ball. This helps to compact the dough and remove any air pockets. Flatten the dough and return to the bowl. Allow to rest for 1 hour. Cut the dough into 3 equal pieces. Loosely wrap each piece of seitan in the corn husk and secure with twine. Bring a large pot of water to a rapid boil. Add the seitan. Reduce the heat to Medium Low and boil the seitan for 15 minutes. Every 5 minutes, rotate the seitan so it cooks evenly. Remove, drain in a colander and allow to cool for 5 minutes before unwrapping. 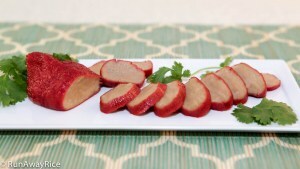 Prepare the marinade by combining the roast pork seasoning with the soy sauce. Add the seitan and rotate in the marinade coating all the pieces completely. Marinate for 1 hour. After 1 hour, rotate the pieces and marinate for another hour. Heat a skillet over Medium High heat. Add oil and seitan. Pan fry on each side for 1 minute. Add the water. Swirl and flip the seitan coating the pieces in the sauce and cook until the water is completely evaporated. (This takes approximately 4-5 minutes.) Once all the water is cooked-off, pan fry each side until golden brown. Remove from heat. does the baking powder eliminate rubbery, tough consistency of most seitan? i seen you said it was like a firm tofu.. i do not like anything i have to chow allot on, do to physical limitations. so i am hoping that this is what the b. powder does for it.. also, i noticed you do not boil it for and hour or, 2, so, does that also help it not to be so rubbery? i am excited to see what you are doing here.. and hoping i can adapt this to other recipes so i can use them, simply by adding the powder and not cooking so long..
Hi Fran, the baking powder helps to make the texture lighter and less rubbery. Yes, boiling less also helps to improve the texture. I hope you try my recipe and stop back to share your results. Good Luck!